Greetings to you, dear user of mobile devices (smartphones and tablet computers) based on the wonderful and very functional Android operating system (4). Install games and various applications directly on the memory card. This is just a mega useful feature and opportunity, now you will not need to clutter up the memory of your Android (4) (Android) device, because all applications can be installed on a memory card. Here is a list, by the way, I want to note that the list is not complete, utilities and new features that give you root (root) rights. In order to install (receive) root (root) rights on your Android (4) device (smartphone or tablet computer), we will use an excellent, free program on a personal computer called - Kingo Android (4) ROOT. The program you can download (receive) from the official website of the company Kingo at this link - http://www.kingoapp.com/index.htm. In order to download the program, click on the suggested link and click the “Download” button, which means “download” in Russian. I will not describe the process of downloading and running this program, since he is very simple. Once you have managed to download the program to your computer, you need to run it and follow the instructions below. 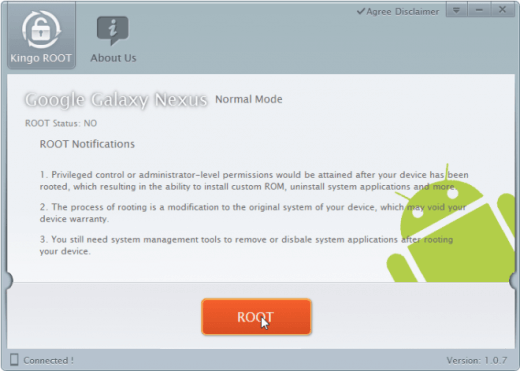 After installing the root (root of rights) rights of your Android (4) (Android) device, the Kingo Android ROOT program will notify you of the completion of work and will offer to restart your device. To ensure that your root (root) rights, i.e. super rights, take effect you need to agree to restart and restart your gadget. It's important: you can also use this program to cancel (receive) rutting. There may be a lot of reasons, for example, after the above actions you noticed any changes, for the worse, in the operation of your Android (4) (Android) device (mobile phone or tablet computer). To cancel rutting, all the steps described above are just, but instead of the “Root” button, click the “Remove Root” button. Today, this is all, I hope (you managed to download the proposed program for rutting (Ruth is right)) you received the information for which you actually came here. Also welcome comments that you leave to this article..